"The good, the bad, the so-so… Make all of it work for you." Artwork of Lyle from Animal Crossing: New Leaf. 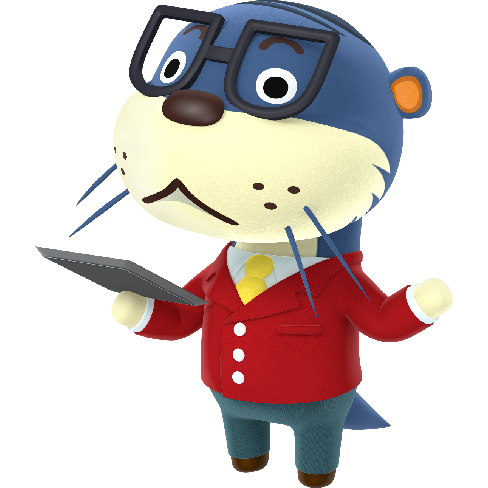 Lyle is an insurance salesman that appears in Animal Crossing: Wild World, Animal Crossing: City Folk, and Animal Crossing: New Leaf. He is a blue otter with large whiskers and a hunched appearance, though he is sometimes mistaken for a weasel. He works as an insurance man in Wild World, selling insurance and giving refunds on forged paintings. In City Folk, he has a new job, working for the Happy Room Academy in their headquarters in the city. In New Leaf, Lyle continues working for the expanded Happy Room Academy, where he is stationed in Nook's Homes. Lyle makes his first appearance in Animal Crossing: Wild World working as an insurance salesman. He appears every Saturday between 6 am and 6 pm outside the player's house to take a survey. He will follow the player for a time if they do not talk to him immediately, a sign of his persistent nature. Upon talking to him, he will ask a number of unanswerable questions, heckling the player into signing a health insurance policy. The only way to avoid this is either by declining to take the quiz or by not having sufficient funds (which will "bust his chops"). By paying 3,000 Bells, the player will receive 100 Bells every time he or she is injured - this includes tripping or getting stung by bees. However, players can receive the 100 Bells bonus only once per day. A further payment of 6,000 Bells on the following Saturday will result in the players' receiving compensation of 100 Bells if they buy a counterfeit painting, but only if the painting is presented to Lyle himself. Normal villagers sometimes warn of a health insurance scam operating in the area, which is a reference to Lyle and his scamming techniques. Some jock villagers also say the same thing - how this "guy" came and asked them if they wanted their muscles insured. At first they said no, because "whoever's heard of insuring your muscles?" and that another villager told them it was a scam. Lyle is also believed to be working with Redd, scamming people out of money. In his questionnaire, Lyle asks for what weekday Redd should appear in the town, after which Redd will appear on that day, but will also deny any connection with him. Lyle appears to have a more respectable job in Animal Crossing: City Folk, working in the Happy Room Academy Headquarters in the city. He will mention how much he hates his new job, and frequently talks of his old, "high-flying" lifestyle. He seems to be calmer, possibly to fit in with his new "happy" job and only makes a reference to "bustin' [his] chops" once, if the player refuses to join the HRA. When talked to, his persistent nature leads him to continue talking with the player until they agree to join the Happy Room Academy. If the player's house becomes the model room, he states (if they decide to discuss the model room with him, not the evaluation) that he is trying to love his new job. An ad for the HRA, with his picture on it, can be seen in the bus, behind Kapp'n's seat. He makes no reference to his past lifestyle in Animal Crossing: Wild World other than his frequent complaints and mentions of his old office when the player first talks to him. He does not talk about Redd or Crazy Redd's, which is located nearby, implying that he was caught for fraud, and has to work for the HRA, which explains why he does not enjoy his work. At the Happy Room Academy Headquarters, the player can also speak with Lyle in order to find out their current "HRA evaluation" or stop the weekly flow of evaluation letters. It is suggested that Lyle used to be a grave-digger or fossil hunter, because if the player's house becomes the model room and has a particularly valuable fossil in it, Lyle will say that he used to dig up bones in "the yard... not the backyard, the other yard...", implying that it was a graveyard he used to dig in. Lyle returns in Animal Crossing: New Leaf. He appears in Nook's Homes after certain conditions have been met and runs the Happy Home Academy, the successor of the Happy Room Academy seen in previous titles. His office is in the bottom left of the store, where a seating area was previously. Similar to City Folk, Lyle gives the player their HHA evaluation. However, he no longer presents model rooms, a job now done by Digby. Because his office is so easy to access, evaluation letters are no longer an option. Lyle does not appear to complain about his current job, as opposed to his predicament in Animal Crossing: City Folk. Lyle makes a small appearance in Dōbutsu no Mori. He is seen in the background of the fireworks festival when K.K. Slider is singing on stage; he wears the same suit as his appearance in Wild World. He does not talk and makes no other appearance in the film. Lyle has a chance of appearing as a spectator in the Smashville stage. Lyle once again has a chance of appearing as a spectator in the Smashville and Town and City stages. He also appears as a collectible trophy. NTSC-U: Lyle has filled a lot of roles over the years, but in Animal Crossing: New Leaf, he's taken on management of the Happy Home Academy. Drop by to chat, or ask and he'll tell you how the HHA ranks your home. This is a new kind of job for Lyle... You could say he's turned a new leaf! PAL: Lyle has played a few roles over the years, and in Animal Crossing: New Leaf, he's in charge of the Happy Home Academy. Feel free to drop by for a chat or to ask him how the HHA ranks your home. Lyle wasn't a big fan of this kind of work in the past, but he really seems to enjoy it this time. You could say he's turned over a new leaf! Favorite Saying: The good, the bad, the so-so… Make all of it work for you. In City Folk, when the player asks about the model room and states that the player's room is featured, Lyle will say "Lyle's trying to love this job! Look at him dance!" Also in City Folk, when the player rides the bus to the city, a poster of Lyle can be found on the back of Kapp'n's seat. In Wild World, Lyle says he "gotta learn about city folk", a possible reference to the sequel. In New Leaf, he states that he has daughters. Ansimhaessi from "안심해(Please be safe)" and "~씨(Mr. ~)"
↑ Lyle's official Pocket Camp image is CTRP_EAA_NSP-ott01_R_ad.png, the ott part of which indicates that his species is an otter. Modified on April 12, 2019, at 19:44.